"In Flight Until Mysterious Night is aptly titled, brimming with airy, forward motion. The recorded sound is clear and bright. Highly recommended." This work was composed in February, 2009, for the musicians of IonSound Project, specifically for the group’s self-titled 2011 innova CD of my music. While composed in one movement, this composition unfolds in three sections: fast-slow-fast. The fast music is sparkling and animated, with a forward propulsion energized by lively, syncopated rhythms. The slower, middle section provides a thoughtful, lyrical contrast to this music. The piece then concludes with a return of the fast music, bringing the work to a vigorous close. The title comes from a phrase spoken by the character Ion in the Greek play by the same name. Written by Euripides sometime between 414 and 412 B.C., the play follows Ion in the discovery of his origins. Upon his entry in the play, Ion observes: “Gaze on the blazing car of the sun, Whose rays go streaming over the earth, And burn the stars’ light from the skies, In flight until mysterious night.” (Euripedes, Ten Plays, trans. by Paul Roche (Signet Classics, 1998)). The connection of the main character’s name to the group here is direct, of course, and the imagery from the play provided a stimulus and focus for the music I composed. In Flight Until Mysterious Night won the 2013 Chamber Music Competition at Keene State College (NH). 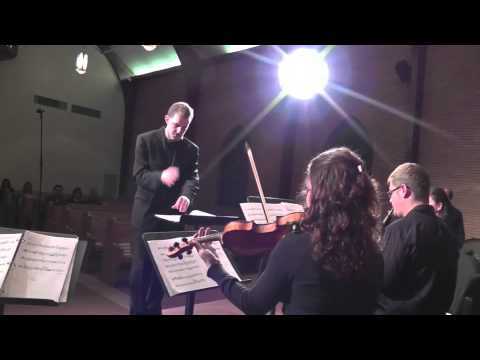 It had been previously included in the 2011 Dallas Festival of Modern Music, conducted by Jordan Smith, and was premiered by IonSound Project (Peggy Yoo, flute; Kathleen Costello, clarinet; Eliseo Rael, marimba; Laura Motchalov, violin, Elisa Kohanski, cello; Rob Frankenberry, piano) in Pittsburgh in June of 2009.